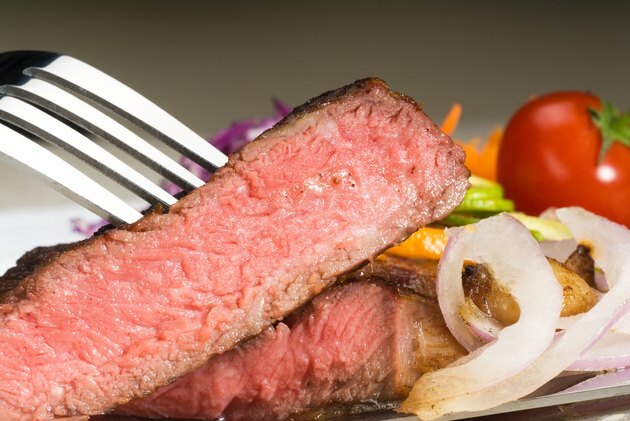 There are many health benefits to selecting an eye of round cut of steak. The Mayo Clinic says the eye of round is one of the leanest available cuts of beef, meaning it is low in fat and calories. According to the National Cattlemen’s Beef Association, one serving of lean beef contains half of the protein you need to consume in a day, along with other nutrients such as zinc and selenium. The two best methods to prepare this cut are pan-frying and braising, both of which retain succulent juices and tenderness. Trim excess fat from the meat as eye of round steaks often have a coating of fat on both flat surfaces. The redness of the meat should be clearly visible. Marinate the meat in desired juices or seasonings and chill overnight in a refrigerator. This allows the flavors of the juices or spices to soak into the meat and helps the meat tenderize. Heat a skillet on high with a thin coating of olive oil. Remove the meat from the refrigerator and bring it to room temperature to allow it to cook evenly. Place the meat on the skillet and cook for three to four minutes per side. Flip once to cook evenly. Serve with vegetables or desired sides. Cut away any surface fat from the flat sides, allowing the natural red color to appear. Heat a skillet on high with a minimal amount of oil. If you want to braise your meat in the oven, you can preheat it to 300 degrees Fahrenheit. Add sliced onions, minced garlic and the steak to the skillet and brown the meat on all sides. Add any seasonings you desire and allow the onions to become translucent. Add beef stock and allow the liquid to reduce. Alternatively, you can transfer the meat to a casserole dish or place the entire skillet in the oven. Cover the whole skillet or dish with a tight lid and cook until you can insert a fork through the thickest part of the meat smoothly. Allow the meat to rest in the juices for five minutes and serve on a plate with the juices poured over the top. Use a thermometer to check the doneness of your meat. For medium rare, aim for an internal temperature of 130 to 140 degrees Fahrenheit.